Turkana Boy, also called Nariokotome Boy, is the name given to fossil KNM-WT 15000,[nb 1] a nearly complete skeleton of a Homo erectus (Homo ergaster) youth who lived at c. 1.5 to 1.6 million years ago. This specimen is the most complete early human skeleton ever found. It was discovered in 1984 by Kamoya Kimeu, a member of a team led by Richard Leakey, at Nariokotome near Lake Turkana in Kenya. Estimates of the individual's age at death range from 7 to 11 years old. Although the specimen is largely considered male due to the shape of the pelvis, the gender is ultimately indeterminate due to its prepubescent age. Estimates of the age at death depend on whether the maturity stage of the teeth or skeleton is used, and whether that maturity is compared to that of modern humans or to chimpanzees. A key factor is that, while modern humans have a marked adolescent growth spurt, chimpanzees do not. While initial research assumed a modern human type of growth, more recent evidence from other fossils suggests this was less present in early Homo. This affects the estimation of both his age and his likely stature as a fully grown adult. Christopher Dean (M. C. Dean) of University College London, in a Nova special,[clarification needed][year needed] stated that Turkana Boy was 8 years old at death. Ronda Graves and colleagues in 2010 concluded that he would "have grown an additional five to 14 cm before reaching adulthood" and that "if, at death, he was eight to ten years of age, [he would have been] 154 centimetres (61 in) tall, and growing faster than a modern human but slower than a chimpanzee. According to this scenario, KNM-WT 15000 would have attained an adult stature ranging between 159 centimetres (63 in) and 168 centimetres (66 in)." Moreover, that "according to our preferred models of growth and development, [his] growth in stature [would have been] completed by 12 years of age (4 years after death), so that the majority of growth has already occurred". The specimen comprises 108 bones, making it the most complete early human skeleton discovered. The skeleton is about 160 centimetres (63 in) tall. In adulthood, Turkana Boy might have reached 185 centimetres (73 in) tall and massed 68 kilograms (150 lb). The pelvis is narrower than in Homo sapiens, which is most likely for more efficient upright walking. This further indicates a fully terrestrial bipedalism, which is unlike older hominin species that show a combined feature of bipedalism and tree climbing. The Boy was relatively tall, which increased his body surface area that would enhance heat dissipation and prevent heat stress under the hot sun. The overall KNM-WT 15000 skeleton still had features (such as a low sloping forehead, strong brow ridges, and the absence of a chin) not seen in H. sapiens. However, there are significant defining characters, such as bigger brain size (880 cc). The arms and legs are slightly longer indicating effective bipedality. The nose is projecting like those of humans rather than the open flat nose seen in apes. Body hair may also have been thinner (most likely naked) and possibly with increased sweat glands to hasten cooling. The skin also was most probably much darker with abundant melanin, as it was necessary to cope with the direct tropical sun rays in the African savannah. 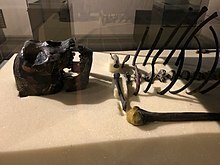 The fossil skeleton and other fossil evidence, such as Acheulean stone tools, prompt the majority of scientists to conclude that Homo ergaster and Homo erectus – unlike their more primitive ancestors – became efficient hunters. The social structure would probably have become more complex with a larger brain volume; the Broca's area of the brain allows speech and is noted by a slight slant on the cranium. Turkana Boy's thoracic vertebrae are narrower than in Homo sapiens. This would have allowed him less motor control over the thoracic muscles that are used in modern humans to modify respiration to enable the sequencing upon single exhalations of complex vocalisations. It was suspected that Turkana Boy suffered from a congenital disorder, either of dwarfism or scoliosis. This was because the rib bones appeared asymmetrical to the spine and the reason was attributed to skeletal dysplasia. However, in 2013, a new study shows that, when the rib bones were carefully rearranged, it became symmetrical against the spine, and that an unusual structure of the vertebrae was characteristic of the early hominins. However, the fossil definitely showed lumbar disc herniation, an injury implicated with his death. He also had a diseased mandible. ^ a b Schiess R, Haeusler M (2013). "No skeletal dysplasia in the Nariokotome boy KNM-WT 15000 (Homo erectus)—A reassessment of congenital pathologies of the vertebral column". American Journal of Physical Anthropology. 150 (3): 365–374. doi:10.1002/ajpa.22211. PMID 23283736. ^ Brown F, Harris J, Leakey R, Walker A (1985). "Early Homo erectus skeleton from west Lake Turkana, Kenya". Nature. 316 (6031): 788–792. doi:10.1038/316788a0. PMID 3929141. ^ a b Stefoff R (2009). First Humans. Marshall Cavendish. pp. 87–88. ISBN 9780761441847. ^ a b c Graves RR, Lupo AC, McCarthy RC, Wescott DJ, Cunningham DL (2010). "Just how strapping was KNM-WT 15000?". J Hum Evol. 59 (5): 542–554. doi:10.1016/j.jhevol.2010.06.007. PMID 20846707. ^ Walker, Alan; Richard Leakey (1993). The Nariokotome Homo erectus Skeleton. Netherlands: Springer. p. 235. ISBN 3-540-56301-6. ^ Walker, Alan; Richard Leakey (1993). The Nariokotome Homo erectus Skeleton. Netherlands: Springer. p. 207. ISBN 3-540-56301-6. ^ Bilsborough A (16 June 1997). "The 1.5-million-year-old". timeshighereducation.co.uk. TSL Education Ltd. Retrieved 30 July 2013. ^ BBC. "Leaving home - 2 million years ago". bbc.co.uk. Retrieved 30 July 2013. ^ The National Museums of Kenya. "KNM-WT-15000(Homo-Erectus) "Turkana boy or Nariokotome boy" - big boy" (PDF). museums.or.ke. Retrieved 30 July 2013. ^ Lloyd C (2009). What on Earth Happened? ... In Brief: The Planet, Life and People from the Big Bang to the Present Day. Bloomsbury Publishing. p. 71. ISBN 9781408805978. ^ Tattersall I (2008). The World from Beginnings to 4000 BCE. Oxford University Press. p. 61. ISBN 9780195167122. ^ MacLarnon AM (1993). "The vertebrate canal". In Walker A, Leakey R (eds.). The Nariokotome Homo erectus Skeleton. Harvard University Press. pp. 359–390. ISBN 9780674600751. ^ MacLarnon AM, Hewitt GP (1999). "The evolution of human speech: the role of enhanced breathing control". Am J Phys Anthropol. 109 (3): 341–63. doi:10.1002/(SICI)1096-8644(199907)109:3<341::AID-AJPA5>3.0.CO;2-2. PMID 10407464. ^ Ghose T (19 March 2013). "Best-Preserved Human Ancestor Didn't Have Bone Disorder". livescience.com. Retrieved 30 July 2013. Leakey, Richard (1994). The Origin of Humankind. ISBN 0-465-03135-8. Leakey, Richard. Origins Reconsidered. ISBN 0-385-41264-9. Barraclough, G. (1989). Stone, N. (ed.). Atlas of World History (3rd ed.). Times Books Limited. ISBN 0-7230-0304-1. Mckie, Robin (2000). Dawn of Man. BBC. ISBN 0-7894-6262-1. Wheeler, P.E. (1984). "The Evolution of Bipedality and Loss of Functional Body Hair in Hominids". Journal of Human Evolution. 13 (1): 91–98. doi:10.1016/S0047-2484(84)80079-2. Lewin, Roger (2004). Human Evolution: An Illustrated Introduction 5th Edition. Wiley. ISBN 978-1-4051-0378-7.